Hearts of romaine tossed with chopped tomatoes, shredded carrots, and a roasted garlic dressing. Topped with an adobo-glazed char-grilled chicken breast, guacamole, salsa, sour cream, blanco cheese, and corn tortilla strips. Dressing served on the side. This mountain of a salad is made up of diced chipotle honey- glazed chicken breast, chopped hickory smoked bacon, hard-boiled eggs, tomatoes, red onions, blue cheese crumbles, and guacamole on top of romaine lettuce tossed with our balsamic vinaigrette. Dressing served on the side. Romaine lettuce tossed in cilantro lime vinaigrette, topped with grilled chicken, grilled pineapple, avocado, tomatoes, and red onions. Dressing served on the side. A fried tortilla shell filled with romaine lettuce, chopped tomatoes, shredded cheese, tossed with roasted garlic dressing. Topped with your choice of shredded or ground beef, shredded chicken, or vegetarian black beans. Garnished with guacamole, crema, and taco sauce. Dressing served on the side. Marinated char-grilled chicken breast served sizzling on top of grilled onions and assorted peppers. Served with a side of fresh guacamole, sour cream, lettuce, shredded cheese, and warm flour tortillas. Make it a Cadillac with red rice and choice of beans! Blackened mahi mahi is served sizzling on top of grilled onions and assorted peppers. Served with a side of fresh guacamole, sour cream, lettuce, shredded cheese, and warm flour tortillas. Make it a Cadillac with red rice and choice of beans! Marinated char-grilled tender, USDA top sirloin steak served sizzling on top of grilled onions and assorted peppers. Served with a side of fresh guacamole, sour cream, lettuce, shredded cheese, and warm flour tortillas. Make it a Cadillac with red rice and choice of beans! We don't skimp on the shrimp! Marinated grilled shrimp, served sizzling hot on top of grilled onions and assorted peppers. Served with a side of fresh guacamole, sour cream, lettuce, shredded cheese, and warm flour tortillas. Make it a Cadillac with red rice and choice of beans! Pick any two. Served with a side of fresh guacamole, sour cream, lettuce, shredded cheese, and warm flour tortillas. Make it a Cadillac with red rice and choice of beans! A combination of three popular items. One ground beef hard shell taco, one cheese enchilada with red sauce, and one shredded chicken burrito with green sauce. Served with poblano rice and your choice of beans. Three of our star entrées mixed together to create a fabulous combination: One small chicken quesadilla, one portobello enchilada, and one ground beef burrito with green chile sauce. Served with poblano rice. Corn tortillas stuffed with shredded cheese and onions, baked, and topped with red or green chile sauce and melted cheddar and Jack cheese. Served with red rice. Corn tortillas stuffed with seasoned ground beef, baked, and topped with red or green chile sauce and melted cheddar and Jack cheese. Served with red rice. Flour tortillas stuffed with strips of tender, USDA top sirloin steak and wild rice, baked and topped with a cilantro roasted garlic cream sauce, and melted cheddar and Jack cheese. Served with red rice. A combination of lobster and crabmeat rolled in flour tortillas, smothered with cilantro roasted garlic cream and roasted tomato sauces, and topped with melted cheddar and Jack cheese. Served with poblano rice. Flour tortillas stuffed with blackened mahi mahi and poblano rice, baked, then smothered with cilantro roasted garlic cream sauce, roasted tomato sauce, and topped with melted cheddar and Jack cheeses. Served with a grilled zucchini. Corn tortillas stuffed with roasted chicken, baked, and topped with your choice of red or green chile sauce and melted cheese. Served with poblano rice. Corn tortillas stuffed with roasted chicken and ground beef, baked, and topped with green and red chile sauce with cheddar and Jack cheese. Served with red rice. Flour tortillas stuffed with grilled shrimp and wild rice, baked, and topped with a cilantro roasted garlic cream sauce and melted cheddar and Jack cheese. Served with poblano rice. Flour tortillas stuffed with fresh portobello mushrooms and wild rice, baked, and topped with a cilantro roasted garlic cream sauce, and melted cheddar and Jack cheese. Served with red rice. A large flour tortilla stuffed with your choice of ground beef or shredded chicken, fried crisp, and topped with choice of red or green chile sauce, melted cheese, guacamole, and sour cream. Served with rice and choice of beans. A large flour tortilla stuffed with your choice of pinto or vegetarian black beans, grilled peppers, and onions, topped with roasted fresh tomato sauce. Served with red rice and fresh grilled zucchini. A large flour tortilla stuffed with roasted chicken grilled peppers and onions, topped with your choice of red or green chile sauce and melted cheddar and Jack cheese. Served with rice and your choice of pinto or black beans. A large flour tortilla stuffed with seasoned ground beef, grilled peppers and onions, topped with your choice of red or green chile sauce and melted cheddar and Jack cheese. Served with rice and your choice of pinto or black beans. A large flour tortilla stuffed with your choice of chargrilled tender, USDA top sirloin steak or grilled chicken breast, grilled onions and peppers, and melted cheddar and Jack cheese, then brushed with our tangy BBQ sauce and grilled. Served with rice and your choice of pinto or black beans. Our third-pound all-beef patty topped with marinated lettuce, tomato, and mayonnaise. Served on a toasted bun. Served with fries. Choice of diced, breaded, deep-fried chicken strips or diced grilled chicken tossed in buffalo hot sauce, and wrapped in a large flour tortilla with shredded lettuce, diced tomato, and blue cheese dressing. Served with fries. Your choice of strips of deep-fried breaded chicken tenders or a diced grilled chicken breast, hickory smoked bacon, shredded lettuce, tomatoes, red onions, shredded cheese, and chipotle mayo wrapped in a large flour tortilla. Served with fries. Our most popular entree soon to be our most popular sandwich. Your choice of char-grilled tender, USDA top sirloin steak or chicken breast tossed in fajita marinade along with grilled onions and assorted peppers. Served on a toasted chiabatta smothered in pepper jack cheese and fries. Sliced and char-grilled tender, USDA top sirloin steak combined with cheddar and Jack cheese, all rolled in a large flour tortilla with cream cheese mayonnaise. Served with fries. Two tacos with your choice of ground beef, shredded chicken or one of each - filled with lettuce, tomato, cheese, and taco sauce. Served with rice and your choice of pinto or black beans. Our grilled, blackened mahi mahi taco filled with lettuce, tomato, cheese, and taco sauce. Served with poblano rice and your choice of pinto or black beans. 3 corn tortillas stuffed with your choice of grilled chicken or steak, topped with cilantro, diced onions, and radishes and drizzled with cilantro lime vinaigrette. Served with grilled zucchini and a small salad. Two vegetarian black bean-filled tacos with lettuce, tomato, cheese, and taco sauce in soft shell flour tortillas. Served with red rice and grilled zucchini. Seasoned mahi-mahi grilled to perfection and served in a flour tortilla with lettuce and our tropical salsa: papaya, mango, pineapple, and strawberry. Served with a side of avocado sour cream, asparagus, and fresh fruit. Pint of salsa with chips. American cheese grilled between two flour tortillas. Quarter-pound patty, cooked over an open flame. Breaded and fried chicken tenders. Your choice of ground beef or roasted chicken with lettuce, tomato, and cheese stuffed in a flour tortilla. Quarter-pound patty, cooked over an open flame, topped with American cheese. Easy-to-eat macaroni noodles topped with creamy cheese sauce. Seasoned ground beef with lettuce, tomato, cheese, taco sauce, and sour cream. Assorted fresh fruit tossed with romaine lettuce and served with cilantro lime vinaigrette. Lobster and crab meat rolled in a flour tortilla, covered in garlic cream sauce and roasted tomato sauce with melted cheese. Pablano pepper stuffed with chicken, cheese, and wild rice, fried then topped with garlic cream sauce. Marinated steak with mushrooms, onions, cilantro, and cheese. A heaping plate of tortilla chips smothered with your choice of pinto or black beans, jalapeño peppers, caramelized onions, shredded cheese, fresh tomato salsa, sour cream, cilantro, and lettuce. 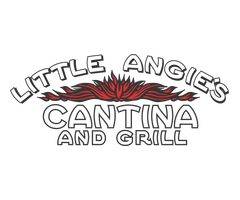 Cant decide how to start off your Little Angies experience? Follow Pancho Villas lead by trying a sampling of our Honey Adobo Boneless Chicken Wings, Chicken Quesadillas, and Angies Nachos Grande. Hearts of romaine tossed with chopped tomatoes, shredded carrots, and a roasted garlic dressing. Topped with an adobo-glazed char-grilled chicken breast, guacamole, salsa, sour cream, blanco cheese, and corn tortilla strips. Romaine lettuce tossed in cilantro lime vinaigrette, topped with grilled chicken, grilled pineapple, avocado, tomatoes, and red onions. This mountain of a salad is made up of diced chipotle honey-glazed chicken breast, chopped hickory smoked bacon, hard-boiled eggs, tomatoes, red onions, blue cheese crumbles, and guacamole on top of romaine lettuce tossed with our balsamic vinaigrette. Marinated char-grilled chicken breast served sizzling on top of grilled onions with red and green peppers. Served with a side of fresh guacamole, sour cream, lettuce, shredded cheese, and warm flour tortillas. Make it a Cadillac with red rice and choice of beans! Blackened mahi mahi is served sizzling on top of grilled onions with red and green peppers. Served with a side of fresh guacamole, sour cream, lettuce, shredded cheese, and warm flour tortillas. Make it a Cadillac with red rice and choice of beans! Marinated char-grilled zucchini, red onion slice, sweet peppers, tomatoes, carrots, and fresh pineapple served sizzling hot on top of grilled onions with red and green peppers. Served with a side of fresh guacamole, sour cream, lettuce, shredded cheese, and warm flour tortillas. Make it a Cadillac with red rice and choice of beans! Marinated char-grilled tender, USDA top sirloin steak served sizzling on top of grilled onions with red and green peppers. Served with a side of fresh guacamole, sour cream, lettuce, shredded cheese, and warm flour tortillas. Make it a Cadillac with red rice and choice of beans! We dont skimp on the shrimp! Marinated grilled shrimp, served sizzling hot on top of grilled onions with red and green peppers. Served with a side of fresh guacamole, sour cream, lettuce, shredded cheese, and warm flour tortillas. Make it a Cadillac with red rice and choice of beans! Flour tortillas stuffed with strips of tender USDA top sirloin and wild rice, baked and topped with a cilantro roasted garlic cream sauce, and melted cheddar and Jack cheese. Served with red rice. Grilled chicken breast wrapped in flour tortillas and covered in black beans, shredded cheese, lettuce, tomato, and fresh avocado. Drizzled with spicy Sriracha sauce and crema. A large flour tortilla stuffed with your choice of roasted chicken or seasoned ground beef, grilled peppers and onions, topped with your choice of red or green chile sauce and melted cheddar and Jack cheese. Served with rice and your choice of pinto or black beans.